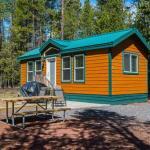 Set in Sunriver Bend-Sunriver Camping Resort Cottage 3 offers accommodation with free WiFi and flat-screen TV. Each unit is fitted with air conditioning private bathroom and a kitchen including an oven and a microwave. A toaster a fridge and stovetop are also offered as well as a coffee machine.